Most Improved or Ruined Thailand Golf Course? I golfed at Muang Kaew in Bangkok last week and after not playing there since last season I have to say that this is the most improved Thailand golf course by far while at the same time may also be ruined for good. How can that be? What is so good about Muang Kaew now? Someone, probably the course superintendent, is doing great work. The greens and surrounding areas are in near perfect condition. 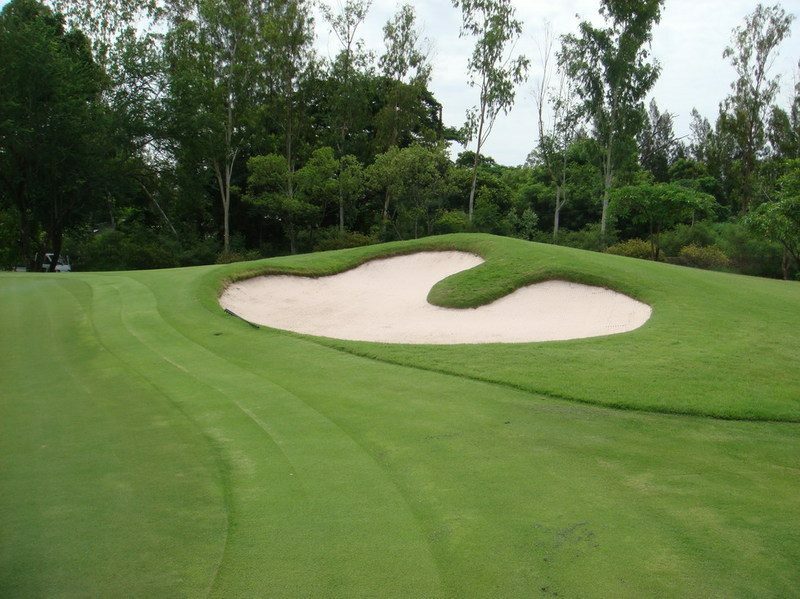 Adding to the already challenging design that was put into play in 2003 when Lee Schmidt and Brian Curley remodeled the entire course, the first and second fringes around the greens were cut as short as most greens on other Thailand golf courses. I forgot to check the stimpmeter ratings for the putting surfaces, but estimate green speed to be around 9.5, and this is in the rainy season where wet conditions make for slower rolling greens. This high season expect conditions to further improve with greens rolling over 10, if not 11 or 12 during the dry months from November to March. This will rival the greens at Alpine Golf Club, which are regarded as the fastest in Thailand. – Fairways being converted to Paspallum grass make for good lies throughout on the carpet like conditions. – Flat tee boxes at the correct yardage from all markers (championship, men’s regular, and ladies tees). The tips are being extended to 7500 yards! – Well stocked and maintained kiosks at holes 3,6,9, 12 and 15. – Continued good, but not pretentious, club house serving the best American sandwiches (i.e. huge sizes) in Thailand! Try the Tuna Panini and see if you can finish it? Now for something I would prefer not to mention. Have you ever heard of a golf course with a six lane elevated freeway running right through the middle of it? Well somehow 4 of the 18 holes at Muang Kaew wound up on the wrong side of Bangkok’s new Western Outer Ring Road. I have no idea how this could happen, but having a freeway in a golf course severely disrupts the serenity of the game, which is one of the prime reasons golfers like the game in the first place. Noisy semi-trailer tucks (lorries?) barreling down between holes 13 and 14 make for a very unpleasant experience, which is a real shame considering the golf course conditions mentioned earlier. It will be interesting to see the fate of Muang Kaew Golf Club. I guess locals will still play as the course is too good and only 20 minutes from town to be ignored. However, golf visitors will probably opt for a more peaceful setting, as the whole point of a Thailand golf vacation is to try to get away from it all. Let me know your thoughts about Muang Kaew and if you want to play in the next few months before the official opening of the Western Outer Ring Road, email me at at my Thailand golf vacation company. We have very special summer rates for a few groups each day. Also I would be interested to know if there are any of any other golf courses in the world that have a freeway smak dab in the middle.